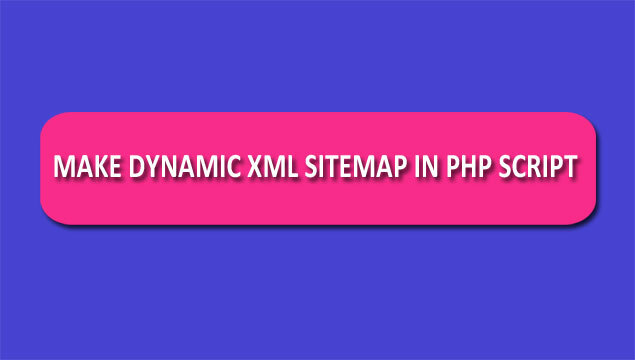 If you want to create dynamic sitemap for your website in PHP, then you have come very right place, because in this tutorial we have make discussion on how can we create XML Sitemap for our dynamic website which is created by using PHP Script. We have already know for create XML Sitemap for static site, there is lots of online tools available for creating XML sitemap for static site. But here we have creating dynamic XML sitemaps by using PHP Script. Here we have made discussion on how to create a sitemap for PHP based website. So first of all what is Sitemap in simple terms. XML Sitemap is a series of webpage URL which can be accessible by search engine crawlers and users. Based on Sitemap search engine will index website page on their search engine. So If you want to index your website web page on Search engine then you have to create sitemap for your website. But here we want to create dynamic sitemap for our PHP website, that means when we have add new web page in our website, then that webpage link must be automatically added into sitemap. For Create XML Sitemap for PHP website, then first of all you have to store web page url into one table, so we can easily fetch URL which we want to added into sitemap. After fetching of all web page URL then after we want to convert into XML format. So by using header() function we can convert page data into XML sitemap format. So when we have run this page then it will produce XML Sitemap with .php extension. But in all search engine sitemap extension must in .xml format. So We have use Apache .htaccess configuration file. In this file we have define URL Rewrite-rule which will be redirect .php URL to .xml URL. So, this we have make dynamic PHP XML sitemap by using PHP script. I have a Statics Website Solar panel Manufacturers how to create dynamic sitemap for a static website?